The Monk Pherapont (Therapont) of Mozhaisk (Belozersk), Wonderworker of Luzhetsk, in the world Theodore (Feodor), was born in the year 1337 at Volokolamsk into a family of the nobility, the Poskochini. From his childhood years he was raised in deep faith and piety, which in graced form was reflected throughout all his subsequent years of life as an holy ascetic. At age forty without preliminaries he was tonsured a monk by the hegumen of the Moscow Simonov monastery, the Monk Theodore (Feodor), a nephew of the Monk Sergei (afterwards Archbishop of Rostov, Comm. 28 November). As a monk in this monastery Pherapont became close with the Monk Kirill (Cyril) of Belozersk (Comm. 9 June). Together they passed through their ascetic deeds of salvation in fasting and prayers, and they hearkened to the spiritual guidances of the Monk Sergei of Radonezh (Comm. 25 September and 5 July), who visited the monastery to instruct the brethren. In fulfilling an obedience, the Monk Pherapont set off to the North, to the Belozersk frontier, on monastery matters. The harsh northern land caught the attention of the ascetic, and he decided to remain there for his ascetic efforts. After his return with the Monk Kirill – to whom the Mother of God had appeared also ordering him to go to the North, the Monk Pherapont received the blessing of the hegumen and set off to Beloozero (WhiteLake). For a certain while the ascetics lived together in a cell that they had built, but later and by mutual consent, the Monk Pherapont transferred over to a new place for his ascetic deeds, 15 versts distant from Kirill, betwixt two lakes: Borodava and Pava. Having cleared a not overly large plot for a garden and building a cell in the deep forest at a water channel, the Monk Pherapont continued his ascetic efforts as an hermit and in silence. At first he endured much deprivation and tribulation in his solitude, and more than once he was set upon by robbers, attempting to chase away or even kill the ascetic. But with time monks began to gather to the saint, and the wilderness place was gradually transformed into a monastery, afterwards called the Pherapontov. In the year 1398 the Monk Pherapont built a wooden church in honour of the Nativity of the MostHoly Mother of God, and the monastery was gradually set in order: the monks toiled together with their saintly guide over the construction of cells, the copying of books, and the adornment of the church. * (* At the end of the XV Century on the place of the former wooden church there was built a stone cathedral, in honour of the Nativity of the MostHoly Mother of God, painted in the years 1500-1501 by the reknown Russian iconographer Dionysii and his sons, Vladimir and Theodosii. The frescoes are devoted to the Praise of the MostHoly Mother of God. The unique frescoes (wall-paintings) of the Pherapontov monastery have been preserved up to the present time and are an outstanding memorial of Russian churchly art and painting, of world significance). At the monastery was introduced a common-life monastic rule, strictly observed by the monks. The Monk Pherapont out of humility declined to head the monastery, and instead entrusted the position of hegumen to one of his disciples. 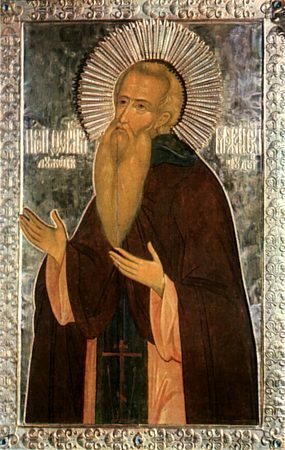 The holy ascetic, endowed himself with the gift of counsel, resorted for spiritual guidance just as before to his friend, the Monk Kirill of Belozersk. News about the ascetic deeds of the saint of God spread far beyond the bounds of the Belozersk frontier. At the beginning of the XV Century, the lands, on which were situated the Kirillov and Pherapontov monasteries, were part of the appanage-holdings of the Mozhaisk prince Andrei Dimitrievich (1382-1432), son of GreatPrince Dimitrii Ioannovich Donskoy (1363‑1389). And in the year 1408 prince Andrei Dimitrievich, having learned of the high level of spiritual life of the Belozersk ascetic, turned then to the monastic starets-elder Pherapont with a request to establish a monastery in the city of Mozhaisk. It was difficult for the monk to leave his own monastery, at which he had asceticised for more than ten years. The Monk Pherapont was met at Mozhaisk with great honour. Soon, not far from Mozhaisk, in the locality of Lushko on an hilly part of the right bank of the Moscow River, the Monk Pherapont founded his second monastery. Its chief temple was in honour of the Nativity of the MostHoly Mother of God, in memory of the Belozersk monastery. Prince Andrei Dimitrievich, deeply esteeming the saint for his true humility, provided generous help in the construction and establishing of the monastery. With the blessing of Sainted Photii, Metropolitan of Moscow (+ 1431, Comm. 2 July and 27 May), – the monastery was to be headed by an archimandrite, and the Monk Pherapont was elevated to the dignity of archimandrite. At this new monastery Saint Pherapont dwelt for 18 years, reposing to God at an advanced age, on 27 May 1426. His body was buried at the north wall of the cathedral of the Nativity of the MostHoly Mother of God. At the place of burial was afterwards built a church in honour of the Monk John of the Ladder (Comm. 30 March), and renamed in 1730 for the Monk Pherapont. Veneration of the saint began soon after his death. In 1514 the incorrupt relics of the holy ascetic were uncovered, and glorified by numerous miracles. After the Moscow Sobor-Council of 1547 there occurred the canonisation of the Monk Pherapont of Mozhaisk, Luzhetsk Wonderworker – resulting from the hegumen of the Pherapontov monastery having brought to metropolitan Makarii (1543-1564) a Life and Account of the sanctity of the saint of God. Set amidst the numerous disciples and conversers of the Monk Sergei of Radonezh, the Russian Church venerates the memory of the Monk Pherapont, who in following the counsel of his great teacher and guide, combined the ascetic feats of silence and solitude with that of active service to neighbour and the spiritual enlightening of his Fatherland. The memory of the Monk Pherapont is celebrated twice: 27 May (Repose 1426), and 27 December (Uncovering of Relics 1514).